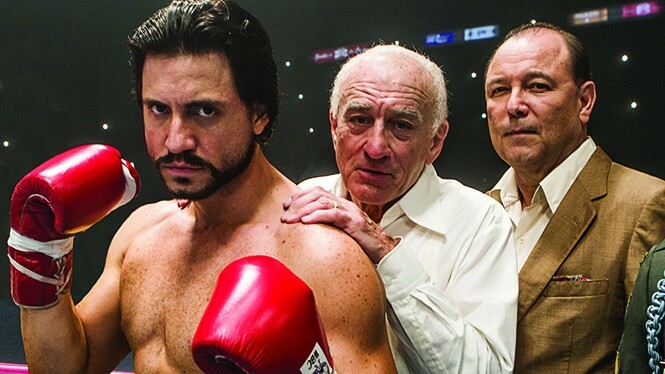 Hands of Stone can't carve out a distinctive space among boxing biopics. You've got to hand this to Jonathan Jakubowicz, writer/director of Hands of Stone: It takes balls of stone to cast Robert DeNiro in your based-on-a-true-story boxing movie. It might be 36 years since DeNiro won an Oscar for playing Jake LaMotta in Martin Scorsese's Raging Bull, but that film remains a kind of gold standard, not just for capturing the visceral, kinetic intensity of boxing, but for shaking up the often predictable rhythms of the movie biography. And here's a relatively inexperienced Venezuelan filmmaker, with his first American theatrical feature release, inviting comparison with a classic. That kind of pugnacious spirit feels just about right for the story of Panamanian boxing legend Roberto Durán (Edgar Ramírez). After opening up with Durán's first American fight—and an introduction by his manager, Carlos Eleta (Ruben Blades), to successful but long-retired trainer Ray Arcel (DeNiro)—Jakubowicz circles back to Durán's impoverished childhood with a single mother. His "origin story" becomes a familiar one of a tough street kid finding a way to survive and thrive through sports, but given a specificity anchored in Durán's intense antipathy toward Americans—the result both of the swirling political unrest of the 1960s and 1970s over control of the Panama Canal, and the fact that Durán's father was an American soldier who left his pregnant mother behind. There's a strong foundation in that background for the relationship between Durán and Arcel, which plays with surrogate parent/child issues on both sides. Jakubowicz finds a few great moments in Durán's corner between rounds—the best parts of Ramírez's performance—as Arcel's attempts to keep him focused collide with the fighter's stubborn ferocity. It's here that the director comes up with what could have been a uniquely perceptive point of view, distinguishing it from the bulk of boxing films: Arcel's constant refrain to Durán emphasizes the strategy of boxing, the part of the fight that is won between the ears rather than between the ropes. That becomes the central concept as the story reaches the two most famous fights of Durán's career, his welterweight title battles with Sugar Ray Leonard (Usher Raymond). Both fights are impacted, Jakubowicz suggests, by playing on the opponent's pride to get them to abandon their strengths, as well as by the sense of finally having "made it" that led to Durán gaining more than 30 pounds between the two 1980 fights. It's almost enough to make you not want to roll your eyes at those old-school boxing aficionados who referred to it as "the sweet science." The problem with Hands of Stone becomes the same problem that plagues too many film biographies: a refusal to trust that the story can be told without a mountain of "then this happened, then this happened" details. Jakubowicz spends ample time on Durán's courtship and relationship with his eventual wife, Felicidad (Ana de Armas), leading up to the inevitable moment when his success-driven excesses lead to a rift in their marriage. There's a detour involving one of Durán's childhood mentors, the Fagin-like Caflán (Óscar Jaenada), and a scene in which Durán at last meets the father he had never known. And that's saying nothing of the distracting amount of time the narrative spends on background events in Arcel's life, including his run-ins with mobsters in the 1950s and the sudden re-appearance of an estranged adopted daughter. Jakubowicz too rarely trusts that he can make a movie about the art of boxing that happens to include these two characters, rather than yet another cinematic Wikipedia entry.